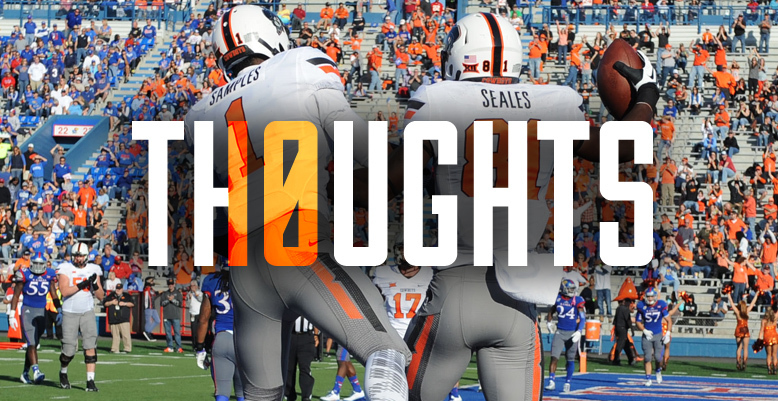 Thanks for the assist, Tyreek, and nine other thoughts about OSU’s 27-20 victory against lowly Kansas. I’m honestly just glad it’s over. OSU is somehow 60 minutes in Ft. Worth from being inside the top 10 and yet I wouldn’t trust this team against an all-star team of Jenks and Union right now. For the second time in three years the Pokes got a scare in Lawrence before The Freek came to the rescue late and put things away. I have many thoughts. 1. The offense was putrid: OSU’s second half total yards figure? Are you emotionally prepared for this number? That includes a loss of five on the final victory formation play but it’s not good when you have to rationalize victory formation plays affecting your total yardage. That’s bigger than an offensive line issue. That’s a systematic issue that I’m not sure has an easy fix. Saddle up for these last six games. 2. Daxx’s variance is not small: Here’s the problem for OSU with Daxx at quarterback — and I thought Bill Connelly smartly wrote this after the Tech game — what do you do if the deep passes aren’t working? Why can’t Daxx throw short passes — not intermediate passes — but short ones like these? There’s nothing about this that doesn’t work. You have athletic, physical wide receivers and a QB with a gun. I’m not sure if this is a Daxx issue (not checking down) or a Yurcich issue (not telling him to stay short) but it needs to be fixed. 3. Michael Cummings isn’t that bad: File this one away in “things I didn’t think I’d be typing this weekend” but KU’s quarterback can ball a little bit. I’m a big believer in this OSU defense and he made them look average at times. He needs some pieces — like saying a good tweet needs some depth to be a good book — but I was mildly impressed. I’m not sure that excuses Spencer’s defense from putting him away (and I’m sure they’ll hear about that at great length) but let’s not act like he didn’t make a few plays in the second half. Plus if you’re OSU’s defense it must be a heavy feeling to know you have to stop the other team AND score in the process. 4. 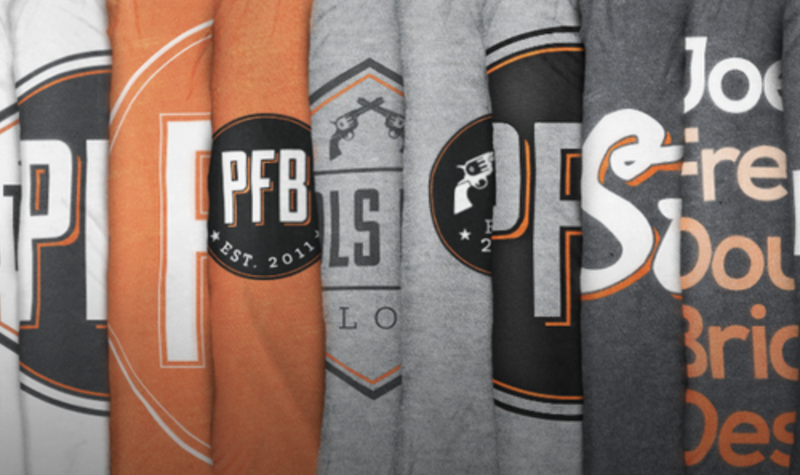 The Freek is always lurking: Let me get this straight…you kick short the entire game so you won’t get burned by No. 24 because your kick return defense is probably the worst of any team’s kick return defense in the nation and then at the very end you go away from that even though OSU had about 40 yards of total offense in 25 minutes in the second half? Also, I’m terrified to think about what would have happened if Tyreek hadn’t done his thing or if there had been a penalty. Raise your hand if you think Daxx was going 80 yards with the game (season?) on the line. So then what? A 97-yard Grogan field goal? Overtime? OSU hasn’t lost in Lawrence since Mason Rudolph has been alive and you could make the argument that only Tyreek kept that streak alive. 5. The offensive line is getting worse: I’m not sure how it’s possible but OSU is starting to look more susceptible up front. Kansas (Kansas!) looked way tougher off the ball for most of the day. It was just stunning to see. Gundy has said all season he’s worried about young guys wearing down and now I’m starting to as well. 6. I think I’ve been spoiled: Am I just the most selfish “I want all of the offense right now this second” fan ever or have these last two games been brutal to watch? I was struggling to stay interested until Tyreek went the distance. With 85 yards on 29 plays it would be hard to blame anyone who wasn’t getting paid to watch this game for not wanting to watch. 7. The part of the game plan I do question: I don’t love sitting back here and saying “Legoman should have done this!” because I don’t have the play-calling knowledge of a peewee coach much less a D1 offensive coordinator BUT I do know that getting the ball to your most dynamic playmaker is a good idea. Tyreek had four touches on offense. Four! He had zero rushes and four catches. He almost died on one of them. Is Yurcich saving his legs for the second half of the season? If so then why was he out there for every kick return? I posited that maybe Yurcich doesn’t know the same guy who did this is on his side when the offense goes out there. That rationalization is at least on the table, isn’t it? 8. Three guys I love: Because this game was so dreadful and I’m quickly running out of coherent thoughts, here are three random dudes I’ve loved this season. Jordan Sterns — This was a boss play. Josh Furman — Is the Michigan stink that bad? Austin Hays — I think he’s our, like, 17th receiver but he can go a little bit. 9. This team is about to get exposed and Gundy knows it: At TCU, Baylor, Kansas State and OU and Texas and WVU at home. If nothing changes that stretch is going to make the Red Wedding episode of Game of Thrones seem like it should have been shown on the Disney Channel. The flip side of that is that OSU has a young squad that can make sizable leaps in short periods of time but from the FSU game until today, this baby is trending in the incorrect direction. 10. Just win: For all of our harumph-ing and finger-pointing OSU is still 5-1 and still controls its own destiny in the Big 12. That destiny might end up looking more like a diagram from Dante’s Inferno than Gundy hoisting a Big 12 trophy in December but they did exactly what we wanted them to do (and thought they would do): win five straight after that thriller in Dallas. This program has a storied history of playing to the level of its competition so I don’t think projecting this game onto the rest of schedule is totally fair. Are there issues? Yes (like asking if Glenn Spencer is intense) but there’s also a stockpile of wins to draw from over the next two months. There isn’t enough emotion in all the sorority houses in the state of Texas for what has happened to TCU in the last two weeks so maybe OSU catches them flat early on in seven days. Gundy better have his side ready.